POWERFORCE technology was born from years of experience in developing clutches for the NHRA. It allows our clutches to have 15% more torque capacity without increasing the pedal effort. It works by using physics to our advantage! As the engine spins the clutch, centrifugal forces are exerted outward forcing the levers to pivot. As these levers pull away and pivot they apply direct pressure to the pressure plate. 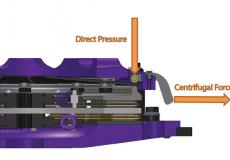 This puts a more efficient and positive load on the pressure plate, unlike other systems that place weights on diaphragms that will cause deflection. Each application, as in the NHRA Pro Stock Class, is specifically designed for the levers to be most effective at peak torque RPMs. This technology is one of that keeps Ace Racing and their customers getting to the finish line first!